Brand new and has never been read. 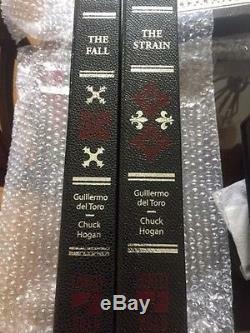 The Strain and the Fall. I have 2 matching sets. Numbered set 446 and 448. 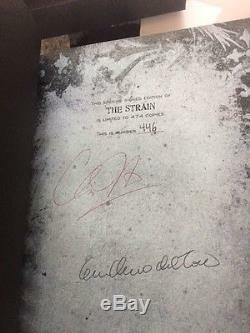 The Strain: The Deluxe Special Edition by Guillermo del Toro and Chuck Hogan. Featuring twenty ORIGINAL illustrations by acclaimed comic artist/director Troy Nixey. A Note About This Special Project: Guillermo del Toro, the visionary creator of the Academy Award-winning. And Chuck Hogan, a Hammett Award-winning author, have brought their imaginations to this series of bold, epic novels about a horrifying battle between man and vampire that threatens all humanity. Is the first installment in this thrilling trilogy and an extraordinary international publishing event, and. 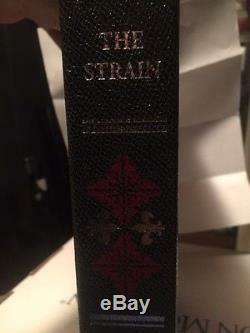 The Strain: The Deluxe Special Edition. 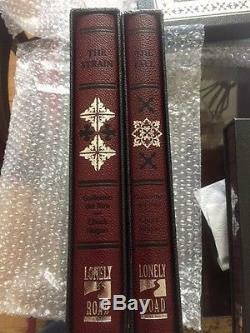 From Lonely Road Books is being designed with the ultimate book collectors in mind. About the Book: They have always been here: Vampires. In secret and in darkness. Now their time has come. In two months the world. 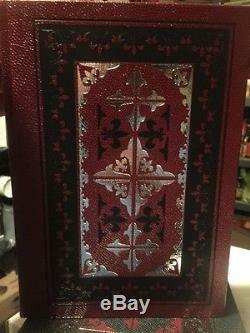 About this Special Edition: With an oversized page size, an extremely low print run, and an old world design to resemble an ancient volume, this special edition will feature a high-quality paper stock and a deluxe binding selected from the finest materials available. This special edition will feature 20 original illustrations by acclaimed comic artist and film director Troy Nixey. 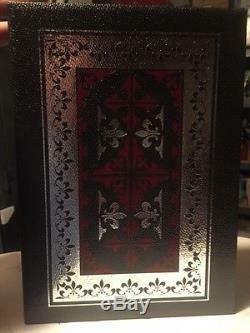 This stunning special edition will be like no other book in your collection. Reviews & Praise: Director Del Toro who won an Oscar for. Makes a dramatic splash in his fiction debut, the first volume in a vampires vs. Humanity trilogy, coauthored with Hogan. Just as a jumbo jet on a flight from Germany to New York is touching down at JFK, something goes terribly wrong. When Ephraim Goodweather, of the Centers for Disease Control, investigates the darkened plane, he finds all but four passengers and crew dead, drained of blood. Despite Goodweathers efforts to keep the survivors segregated, they get discharged into the general population. Soon after, the corpses of the tragedys victims disappear. The epidemiologist begins to credit the wild stories of Abraham Setrakian, an elderly pawnbroker whos the books Van Helsing figure, and concludes that a master vampire has arrived in the U. The authors maintain the suspense and tension throughout in a tour de force reminiscent of Whitley Striebers early work. About the Authors: Born in Guadalajara, Mexico, Guillermo del Toro made his feature directorial debut in 1995 with the film. And has since gone on to direct. Mimic, The Devils Backbone, Blade II, Hellboy I, Hellboy II. Which garnered enormous critical praise worldwide and won three Academy Awards. Chuck Hogan is the author of several acclaimed novels, including. Was awarded the Hammett Prize for excellence in crime writing, and named one of the ten best novels of the year by Stephen King. He lives with his family outside Boston. About the Artist: Troy Nixey grew up on the prairies of Canada and used the long winters to his advantage, writing and drawing as much as possible. A natural storyteller and artist Nixey focused his artistic efforts in the field of comic books beginning in 1990. For sixteen years Nixey worked on a wide range of highly visible properties. Batman, the Simpsons, X-Men, the Matrix. Comics, but it is his more personal work that has garnered Troy his reputation as a unique creator. Deemed truly original with a creepy elegant art style by his peers and eclectic and memorable, an artist who draws some of the most haunting stories in comics by the critics, Troy Nixey has brought his distinct brand of art and storytelling to illustrate stories for some of the most notable creators in comic. They include Mike Mignola creator of. 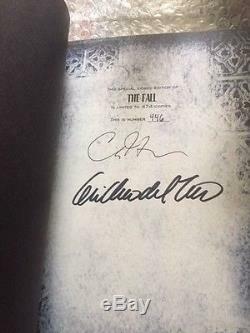 , Neil Gaiman (award winning novelist and screenwriter) and Andrew Cosby creator and producer of the TV series. Even with the success and creative freedom Nixey discovered in comics his first love has always been film. He focused his passion for movies into a short film. That premiered at the 2007 Toronto International Film Festival. His short was warmly received and enabled Nixey to parlay the shorts success into his feature directorial debut. Dont Be Afraid of the Dark. Co-written and produced by Guillermo Del Toro for Miramax Films. Not one to rest on his laurels Nixey has written a script. And has partnered with Phoenix Pictures to bring it to the big screen. 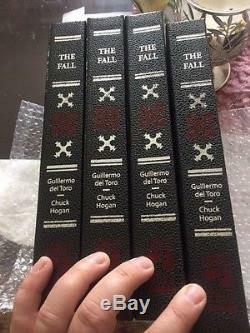 The Fall: The Deluxe Special Edition by Guillermo del Toro and Chuck Hogan. About the Book: Last week they invaded Manhattan. This week they will destroy the world. The vampiric virus is spreading and soon will envelop the globe. Amid the chaos, Eph Goodweatherhead of the Centers for Disease Controls teamleads a band out to stop these bloodthirsty monsters. But it may be too late. Ignited by the Masters horrific plan, a war has erupted between Old and New World vampires. Caught between these warring forces, powerless and vulnerable, humans find themselves no longer the consumers but the consumed. At the center of the conflict lies an ancient text that contains the vampires entire history. Whoever finds the book can control the outcome of the war and, ultimately, the fate of us all. 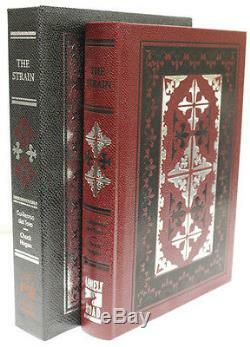 The item "THE STRAIN & FALL MATCHING SET LEATHER BOUND SIGNED NUMBERED HARDCOVER DEL TORO" is in sale since Wednesday, May 3, 2017. This item is in the category "Books\Fiction & Literature". The seller is "musicfan66" and is located in Jackson, New Jersey.